Les Deux Magots is one of the iconic café-restaurants of Paris. It is located opposite Saint-Germain-des-Prés abbey church. The establishment retained the name of the shop that opened on the same premises in 1873. This shop specialized in oriental fabrics and Chinese antiques. It had been named after 'Les Deux Magots de la Chine', a successful theater play of the time. Les Deux magots are the two Chinese statuettes that still adorn the central pillar of the ground-floor room. The cafe replaced the silk shop in 1884. The cafe quickly became the 'lair' of the artists of the era such as Verlaine, Rimbaud or Mallarmé. It soon became the Mecca of poetry in Paris. Auguste Boulay bought the establishment in 1914; his descendants still run it! 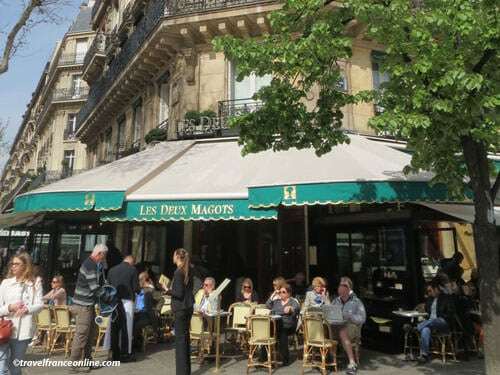 By 1920 Les Deux Magots had become the meeting place for the Surrealist writers led by Jacques Prévert and André Breton. In 1933, they founded the Prix des Deux Magots, after André Malraux received the Prix Goncourt for his book La Condition Humaine. The literary café Les Deux Magots was officially born! The existentialists settled in Saint-Germain-des-Prés after WWII. The cafe became the meeting place of the great intellectuals, writers, filmmakers, comedians and musicians of that era, who gave the district its international reputation. Some spent their nights putting the world to right in Les Deux Magots and the Flore next door, the others playing in jazz clubs. The establishment never ceased to attract the intelligentsia and artists, but also politicians, fashion people and of course tourists. However, it has remained dedicated to old traditions. Customers are still served by waiters dressed in black and wearing a white apron. Les Deux Magots is a true Parisian bistro!